The 30 People Who Have Most Profoundly Impacted my Life. This should be the last entry of the “30” series, at least for now. Though I am pondering doing a forward looking set, i.e., “30 places I’d like to visit”, “30 goals I’d like to achieve.” But it may be getting a little too much. Once again, I hesitated to post this one. It is impossible to really quantify all the people who have had a formative impact on our lives. And though this list is in some ways hierarchical, it is not meant to be a ranking system of significant people in my life, all of whom are invaluable and irreplaceable. Furthermore, I have left any of my former students off this list, despite their inestimable influence on my life, for obvious reasons. But I have written and posted this list as a practice in reflection and thanksgiving. Whose influence has shaped me most significantly? 1-3 The Father, the Son, the Holy Spirit – might be cheesy to put all three, but there it is. What can I say about my God? The source of everything good in my life. 4 Melissa – my wife has impacted my life more than any human being, period. 5-6 Ben and Sophie – kids are a game-changer in so many ways. I didn’t know that it was possible to feel the kind of deep pleasure that I feel towards each of my kids. 7-8 My parents, Warren and Tanya Bailey – the older I get, the more I realize how indebted I am to them. The longer I am a parent, the more I understand their hearts. 9-10 My sisters, Jennifer and Jacquelyn – I grew up with two sisters, one older, one younger. They are both moms now and great ones at that. 11 Cam South – my youth pastor. Cam has taught me more about loving people and the heart of ministry than anyone I know. 12 Jim Capaldo – missionary to Siberia who hosted me for two summers in 2000 and 2002. He taught me volumes about commitment, vision and discipline. Jim’s life motto is “He is worthy!” and Jim lives it. 15 David Rim – a professor from Moody who has shaped my theology more than anyone else, especially when it comes to the the doctrine of the Trinity and personhood. But what I admire most about him is his humility and honesty. In an amazing turnabout, his daughters actually attend my youth group. 16 Cathy Smith – my high school forensics (speech and acting) coach. I was super shy and introverted when I got into high school, yet she saw something in me that she helped me discover and develop. After a horrible tournament my freshman year, I was ready to quit when I overheard her say, “Justin’s not doing well, but he’s going to be one of my stars next year.” I stuck with it, grew in confidence and ability and won the state championship in Oratory my senior year, then placed 4th in the nation, and spoke at my high school graduation. Now that I am a pastor one of my regular responsibilities is to speak publicly. Every time I do, I am thankful to Ms. Smith. 17-19 Kevin Vanhoozer, Bill Dyrness and Richard Mouw – my ThM and PhD mentors. I first admired all of these men at a distance but have since had the privilege to get to know them up close. Dr. Mouw isn’t technically my mentor, but he has adopted me into his neo-Calvinist study group. 20 James Lee – My best friend. We hiked the Incan Trail together. He probably knows me better than anyone other than Mel. 21-23 Ben Thullen, Ben Stapley and Ben Rowe – three roommates during and after college, who stood up at my wedding, and after whom my son is named. They taught me so much about what it means to be genuine. I don’t get to see them often, but I continue to be marked by their influence on my life. 24 Justin Hoskins – like a brother to Melissa and I, we have maintained a strong friendship despite large geographical distances. One of the coolest and most passionate people I know. 25 Jim Houck – almost falls into the “former student” category, but I was never his youth pastor. 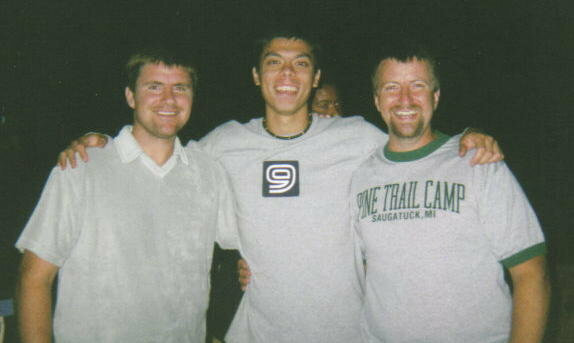 I have known him for many years, but we grew tight when he lived and interned with us one summer. He’s now a youth pastor in the Czech Republic. 28 Tim Keller – a pastor in NYC who has taught me what it means to be gospel-centered. It would be difficult to overstate how much Keller’s writing has shaped the way I think about ministry. 29 Peter Kreeft – Catholic philosopher who is almost like a living C.S. Lewis to me for the way that he fuses reason and imagination. 30 John Piper – another pastor and author. Again, I’m not as excited about him now as years ago, but he definitely left his mark on me (and I suspect many young people my age). 31 Doug Kennard – a professor who was the first to really model what it was like to challenge my traditionally accepted views on the basis of Scripture rather than simply to use Scripture to support what I already believed. 32 Dennis Magary – a seminary professor who taught me Hebrew. His Hebrew Exegesis class is the best class I’ve ever taken. 33 Frank Pardue – was a youth camp speaker I heard when I was 15 and 16. His messages were the words that I needed to hear at that time in my life, and it was in that setting that I most clearly understood who Jesus was, what he had done for me, and what that meant for my life. It’s amazing how someone you only know for a short time can have such an impact. For these and all the people who have touched my life, I am so thankful. I hope I can take the investments that others have made in my life and keep pouring into others. If you made it to the end, thanks for reading! So blessed to be thought of my friend; more humbling than anything. Thank you for being my counselor. I know we don’t talk much these days, but please know that you are dear to me. I know man. We think of you and Leah often and always talk about driving up to see you. One of these days we will! Thanks for being who you are, man. so cool to read this justin! i love that i knew many of these people. i had a little bit of an emotional response as i remembered how these people have been influential to me as well.